Announcement ARF™ Euro Pet Decals, Magnets & Gifts are original designs created to express love of pets, raise awareness of animal rescue, and help rescues & shelters raise funds. Every sale helps support animal rescue. Great for Fundraisers, Gifts, Incentives, Auctions, Raffle & Door Prizes, Volunteer Rewards, Customer Appreciation, Retail Sales, and more! Show your love & dedication to animals & rescue! ARF™ Euro Pet Decals, Magnets & Gifts are original designs created to express love of pets, raise awareness of animal rescue, and help rescues & shelters raise funds. Every sale helps support animal rescue. Great for Fundraisers, Gifts, Incentives, Auctions, Raffle & Door Prizes, Volunteer Rewards, Customer Appreciation, Retail Sales, and more! Show your love & dedication to animals & rescue! Very cute and neat item! Fast shipping, great seller, good deal, quality product! Thank you! 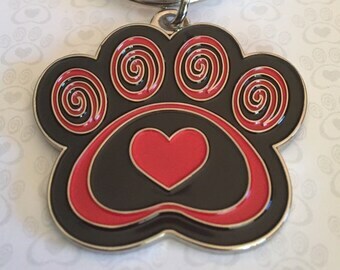 If your fur baby holds your heart in their paws, then this is for you ️ Pawsitive Flair™ ~ Enamel Pins, Charms & Keychains ~ In store soon!!! Father’s Day is June 17th! We have pawsome gifts for all your favorite Fur Daddies! SNEAK PEEK New Magnets and Decals!!! ️ In store and on your car soon!!! There's nothing quite like the bond between human & dog. As someone born with paw prints on my heart, I get it! In April 2014, I became involved with dog rescue as a volunteer transport driver, and became more aware of the challenges shelters and rescues face every day. And I mean EVERY DAY! Rescue does not take a day off, does not close for holidays, does not take a vacation - it's 24/7 nonstop. Abuse, neglect, homelessness happens all day every day. The time, energy, and passion these volunteers expend to save lives (whether it's one life or 100) never ceases to amaze me. And yes, I said volunteer. Most of the people involved in rescue do not get paid. In fact, most have jobs and do this on the side! Most shelters and rescues operate on a shoestring budget (usually in debt), relying on donations from other compassionate, kindhearted folks. Their level of dedication and commitment to this life-saving effort is undeniable. As the saying goes, it takes a village, and truly it does. No one does this alone. It is a coordinated effort of rescues, shelters, volunteers, fosters, transporters, donors, adopters, networkers and educators. To see it in action is to witness a miracle of the heart. I know it’s all about the animals! I also know it takes money to save lives. That’s why I want to partner with shelters, rescues and YOU to Paw It Forward. Every sale generates funds for animal rescue. THANK YOU for making a difference! This makes my heart wag! Did you know a dog wags it’s heart with it’s tail? Yup, scientifically proven… er, something involving treats… Woof! For information on reselling ARF™ products, private message me on Etsy, Facebook, or contact me on my website. If there is a specific product or design you're looking for, just give us a yelp! The pack is very busy creating new designs! Well... after napping... and playing... and eating... and napping....... Hey, it's a dog's life... Ruff! I am new to the Etsy world, but not new to design. I've been a graphic designer for over 20 years, and a dog lover for much longer! There's nothing quite like the bond between human & dog. As someone born with paw prints on my heart, I get it! Welcome to Animal Rescuers Friend™! You’re in the dog house now… and that’s NOT a bad thing!! Come. Sit. Play. We will roll over backwards to fetch you quality products that you’ll be happy to display, give as gifts, donate to fundraisers, or sell in your store. These are original designs created from my own heart & paws to express the love we feel for our pets and raise awareness for animal shelters & rescue work. Every sale generates funds for animal rescue. Thanks for sniffing around. If there is a specific product or design you're looking for, please give us a yelp! The pack is very busy creating new designs! Well... after napping... and playing... and eating... and napping....... Hey, it's a dog's life... Ruff! We want you to be tailwaggin' happy! And if you're not, we're not. If you are dissatisfied with an item, please contact us first, then return it in its unused condition, and we will replace it or issue you a refund. We are not responsible for errors in installation. Please refer to the included instructions if you're unfamiliar with installing vinyl decals. YouTube has many helpful instructional videos too. Removable decals are not reusable. Please feel free to contact us with any questions. Payment is required before item is shipped. We accept all major credit cards through Etsy's Direct Checkout or PayPal, as well as Etsy gift cards. All items are shipped via USPS First Class Mail with Tracking, or USPS Priority Mail which includes Tracking. Tracking allows you to follow it and know when to expect its arrival. I'm happy to combine shipping for multiple items. PLEASE NOTE: USPS does not guarantee delivery times through any service except USPS Priority Mail Express. Please contact me for an estimate if you wish to use this service. To further my mission of helping animal rescue, I am striving to provide excellent products and service. Please help me by leaving a positive review if you are happy. If you are not happy, please give me the opportunity to make it right before leaving a negative review. Reviews build buyer confidence and feedback tells me what I’m doing well and what I need to improve. I welcome both! We love to help animal rescues & shelters raise much needed funds for their work! One of the ways we do this, besides direct donations, is to allow them to purchase ARF™ Products at wholesale prices, so they can generate ongoing income by selling the items in their Gift Shops. Make sure surface area where magnet will be applied is clean and dry. It is recommended to remove magnet before washing vehicle; and to periodically reposition it to prevent any moisture from getting trapped between magnet and vehicle. Make sure surface area where decal will be applied is clean and dry. Remove decal from backing. Place one end of decal on desired location and slide edge of a plastic card across decal. Run edge of card toward outer edges of decal to smooth out any air bubbles. We are not responsible for errors in installation. Removable decals are not reusable.